Every year on the 3rd weekend in July, the Rock River Artists open their homes and studios for a weekend-long tour, inviting visitors to view their creative processes, purchase artwork, and interact directly with the artists. The annual open studio Tour allows visitors to get a behind-the-scenes look into the unique locations where each artist’s work is made. Come take a trip through our rural villages — visit rustic studios down county lanes, or high up in the hills with spectacular views; visit studios with lush gardens and landscaping; and studios tucked away in the woods, or along the river’s edge — and see how and where art is made in Vermont. The 27th annual Open Studio Tour takes place this year on Saturday, July 20, 10PM to 6PM, Sunday, July 21, 10AM to 5PM, starting at the Old Schoolhouse in South Newfane village, where 12 participating artists present a group show. The Schoolhouse itself is worthy of a visit, as it’s a classic 19th-century structure which formerly housed the village one-room school. 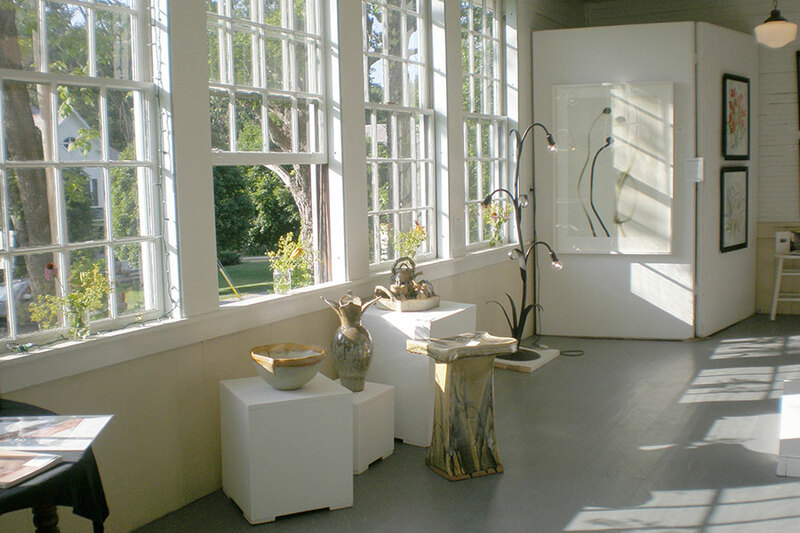 On the weekend of the Rock River Artists Tour, the historic Old Schoolhouse with its maple wood floors and natural light streaming through old glass windows, is magically transformed into a premier contemporary art viewing venue. At the Schoolhouse, you’ll see a representative sampling of each Rock River Artist’s work. Pick up a map to the studio locations and begin a self-guided tour of the studios of your choice, all within short driving distance of the Schoolhouse. Admission is free all weekend. For more information, contact Roger Sandes at 802-348-7865 or rs@rogersandes.com. The tour begins at the Old Schoolhouse, 387 Dover Road, at the intersection of Dover and Auger Hole Roads in South Newfane, Vermont. From the North and South: Take I-91 to Vermont Exit 2. Turn left at the bottom of the ramp on Western Avenue. Proceed east on Western Avenue to Cedar Street, the 5th street on the left, 0.5 mile. Turn left on Cedar street and follow it to its end at Route 30, 0.7 mile. Turn left and follow Route 30 for 8.2 miles. Turn left at Williamsville Road (its name changes to Depot Road at the Dummerston-Newfane town line). Follow this road for 2 miles, until it comes to a T just after the bridge over the Rock River. Turn left at the T, on Dover Road for 2 miles. You will pass through Williamsville, over a covered bridge, and into South Newfane. The Old Schoolhouse is on the left and will be signposted. From the East: Take Route 9 west across the Connecticut River and into Vermont, straight through the roundabout to I-91 South. Proceed south to I-91 Exit 2. Then follow the directions above. From the West: Take Route 9 east to downtown Wilmington. At the traffic light turn left (North) on Route 100 (North Main Street) and follow for 3.9 miles. Turn right on East Dover Road until it comes to a T with Dover Hill Road. Turn right on Dover Hill (it becomes Dover Road when over the hill) for about 8 miles to a stop sign in the center of South Newfane. The Old Schoolhouse is across that intersection (with Augur Hole road) and will be signposted. Whether you’re looking for a downtown hotel, a cozy cabin, or a country inn with sweeping vistas, you’ll find a place to stay nearby. Here are a few ideas to get you started. Annual community BBQ Dinner. 6-8pm. A real Vermont experience in historic Williamsville Hall. Pulled Pork, chicken, baked beans, cole slaw, and corn bread; $12 per person; Kids under 10, $8. Vegetarian options too! Bustling eatery serving brick-oven pizzas & creative Italian fare in stylish surrounds.